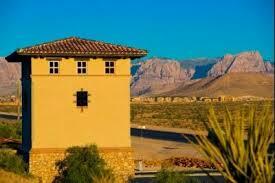 Mountain's Edge is a master planned community in Southwest Las Vegas, NV.The community features hundreds of acres of land devoted to open spaces, parks and trail systems. It also has been designed to honor the land on which you will live. From its inception, Mountain's Edge was developed as the region's first drought-tolerant community. The lush desert landscaping throughout the community provides a strong visual impact even as it conserves the desert's most valuable resource: water. It is estimated that the landscape plan at Mountain's Edge saves over 200 million gallons of water annually versus traditional grass sod landscaping. Maravilla Vistas - Is an all new collection of contemporary designed 2 and 3 story homes adjacent to Nathaniel Jones Park. Homebuyers will enjoy the flexible floor plans and features such as Ryland Homes Signature Rooftop Decks, tech centers, first floor bedrooms, dual master suite option and scenic vistas of nearby mountains. San Gabriel - These single family homes have exceptional living space, featuring a plan with a bedroom and full bath downstairs, lofts and extra large master bedroom closets. Aspire - An upscale gated community located.Aspire is conveniently located near shopping, dining, parks and schools. Serenada - This family friendly community has floor plans up to 6 bedrooms and is conveniently located near shopping, dining and schools. Evergreen - Evergreen will introduce a collection of newly designed 2 story homes. This collection feature homes that offer super bonus rooms, master bedroom retreats, tech areas and walk in pantries as well as oversized garages. Denali - Premiere community with 3-5 bedrooms, two-story homes featuring great rooms, lofts, courtyards and 3-car garages. Coldwater Crossing - Features four 3 and 4 bedroom floor plans, each with 3 elevations. Sutter - 6 home designs. Single story. 3 - 5 bedrooms. 2 - 2.5 baths. 2 car garages. Jasmine Falls - Luxury low maintenance homes located in the beautiful master plan of Mountains Edge. This exclusive community has many amenities including a pool, cabana, walking trails, kids play area and dog run. For more information about Mountain's Edge, Las Vegas, NV Real Estate please contact the McKenna Team at 702-434-4663. Sign up at our website to get the latest homes for sale in Mountain's Edge. Start your search now and find your dream home. When it comes to Mountain's Edge Real Estate and homes for sale in Las Vegas, NV the McKenna Team is here to provide you with the best service. Updated: 25th April, 2019 11:32 PM.